The CPMR’s Atlantic Arc Commission’s (AAC) member regions have taken part in key debates concerning the EU Common Fisheries Policy’s (CFP) new Discard Ban and Landing Obligation measures. 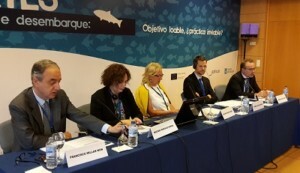 Regions involved in the AAC’s Fisheries and Aquaculture Working Group gathered in Vigo, Spain, on 26-27 June for the seminar “Discard ban and landing obligation, laudable but impractical objectives?”, organised by the Xunta de Galicia region. The seminar discussed the Discard Ban and Landing Obligation measures from the perspective of the fishing sector, as well as the regions, Member States and EU institutions. In attendance were: Rosa Quintana Carballo, Regional Councillor for Fisheries and Maritime Affairs of the Xunta de Galicia, Pierre Karleskind, Vice-President of the Brittany Region and President of the CPMR Fisheries Inter-Commission Working Group, and Christophe Priou, Vice-President of the Pays de La Loire Region and President of the AAC’s Fisheries and Aquaculture Working Group. They were accompanied by representatives of fishermen and ship-owners from their regions. The EU institutions were represented by MEP Francisco Millan Mon, who stated that the basic regulation of the CFP must ensure more flexibility to address the socio-economic impacts of landing obligation. Jose Miguel Corvinos, from the Spanish Ministry of Agriculture, Fisheries, Food and Environment, explained that Spain is contributing to the development of joint recommendations with fishermen, scientists and regions, which will be presented to the European Commission and nurture the forthcoming discards plans for Atlantic fisheries. In Brittany, they will cost around 17 million euros per year per ship fishing whiting. According to the University of Nantes, in Pays de la Loire, the fishing fleet in the Biscay Bay would face an economic loss up to 20%. 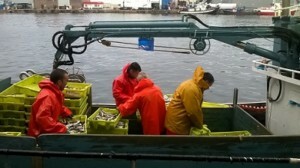 Galicia highlighted the problem of choke species in the case of mixed fisheries. With the new measures, fishing boats have to stop fishing when the quota for one of the fish species is reached. This is a real economic problem for fishermen, given that a mismatch already exists between quotas assignation and quotas consumption. Galicia estimates that it represents a loss of 1,000,000 tonnes of fish and 31,000 jobs on board between 2008 and 2014. On the following day, several field trips were organised to understand the importance of the fishing sector in Galicia, including visits to the port of Vigo, the fish auction facilities, the enterprise ATUNLO, which specialises in frozen products, and the ARMON shipyard. The afternoon focused on projects related to the exploitation of species with low commercial value. CETMAR (Technologic Centre for the Sea), the Shipowner associations from Vigo and Marin, and business selling canned and frozen products, presented projects that are trying to cope with the discard ban and landing obligation measures.